I don’t know about your toddler my my little man loves magnets! He loves playing with the magnetic letters my mom found for him forever ago and now even sorts them by color. Plus, since they’re on the refrigerator, it’s convenient for me when I want to cook or clean up the kitchen. I thought I’d add something to his magnetic collection that’s also great for us to use together. These are great for when you first tell the stories to your little one and even when they know it by heart. Then they can retell the story to you! Now before we start, if you’re super artistic and want to draw these out, have at it! I tried that as my first approach and then started to get really frustrated trying to draw a bed. So I went a different route! Find some pictures online of your characters and key points of the story. 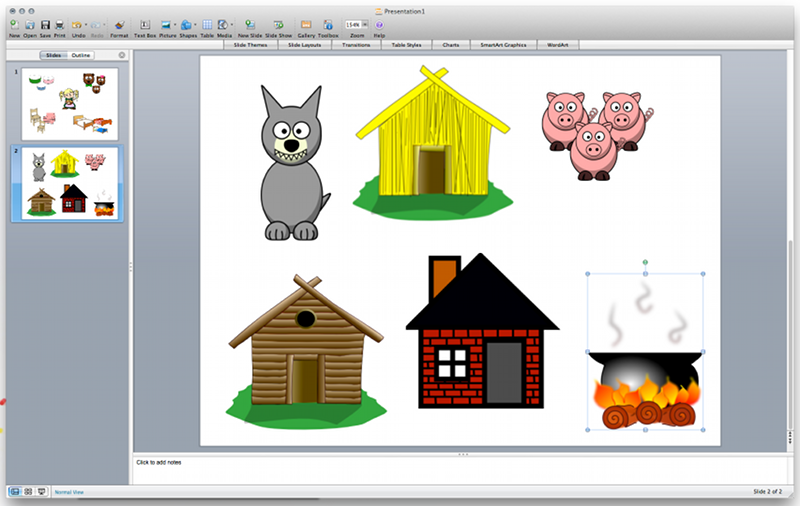 I found all but one of my graphics from clker.com, a completely free library of clipart. You may have to combine some graphics, or even draw a little on one or two, like you’ll see with the picture of the three chairs. 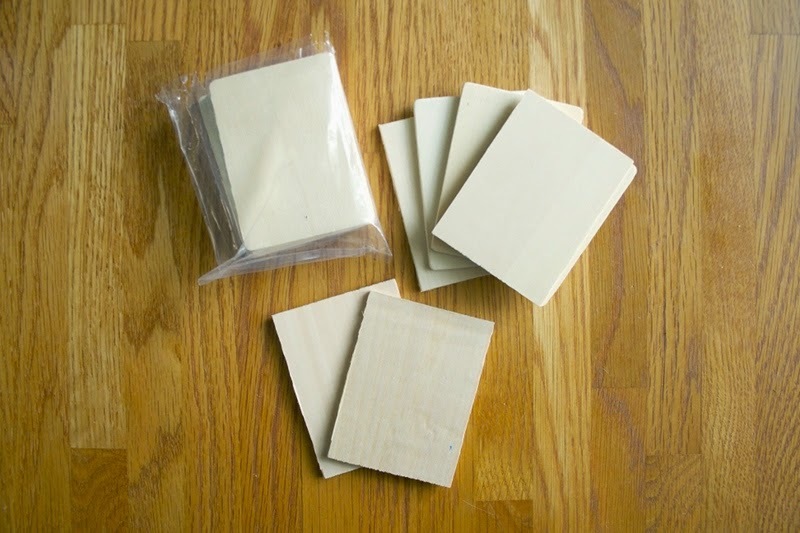 Print, cut out, add to the pictures as necessary, and Modge Podge your clipart to the wooden pieces. Back to my example of the chair picture, I added a little blue pillow with a spar pie to make the little chair look “just right”. 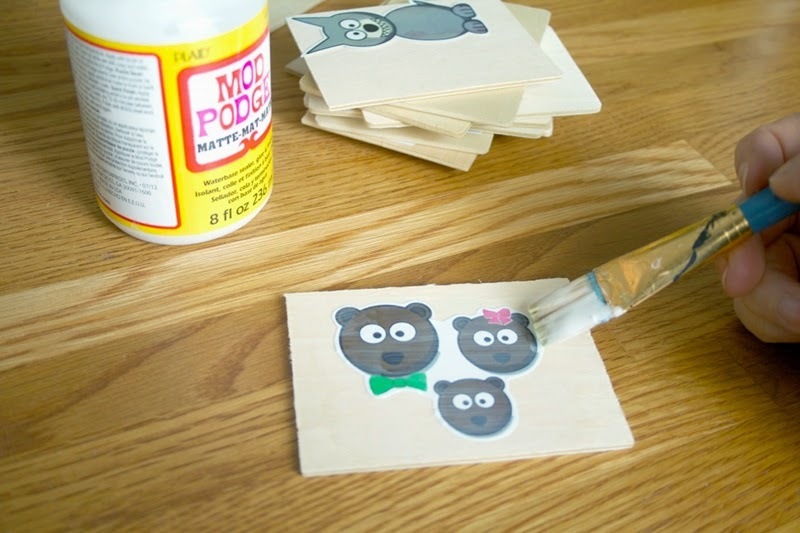 Let them dry then slap a magnetic strip to the back. I used a glue gun to really ensure the magnet would stay on. I have so much fun using these with him since he already knows these stories and he can help me tell each one. He loves when I act out the huffing and puffing parts of The 3 Little Pigs! This is a great idea. I may incorporate this into our homeschool. 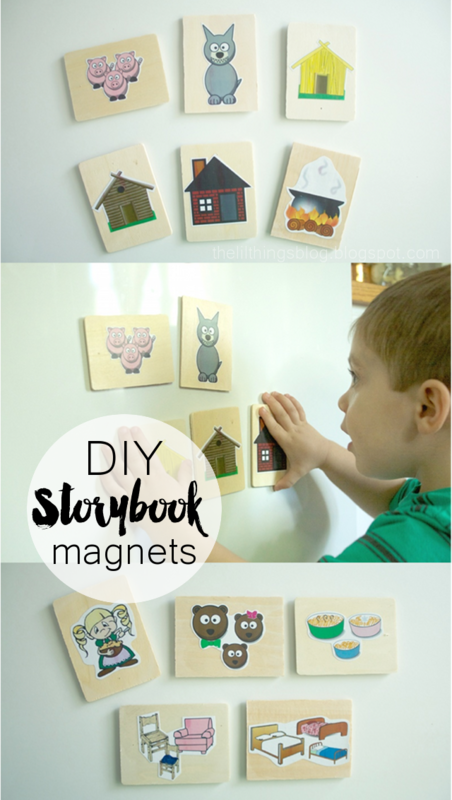 My 4 year old loves magnets and I use a cookie sheet for him. 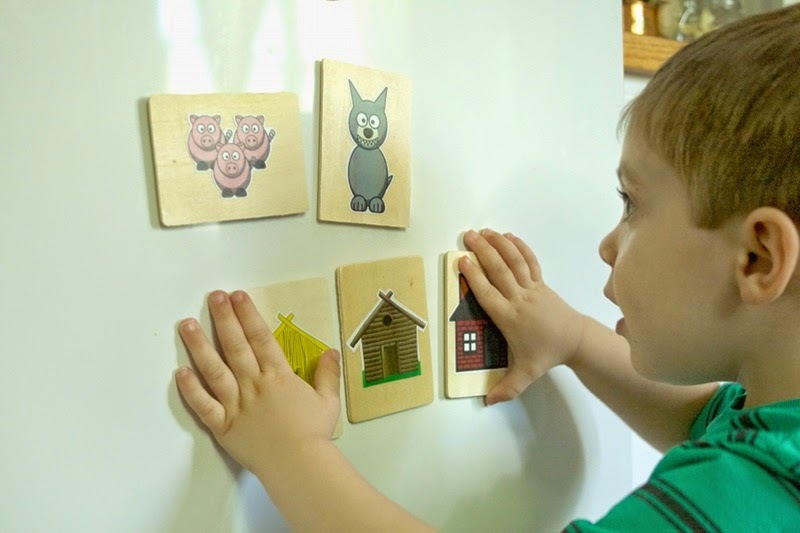 This might be a great way for him to learn story order and for me to gauge if he is actually paying attention or not. Thanks! 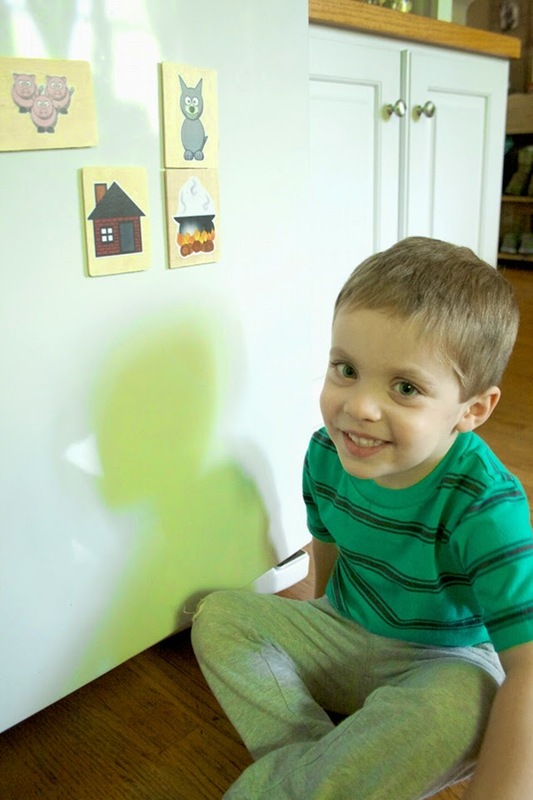 It definitely surprised me what he knew already of these stories from watching "Super Why"! Love this idea, there's so many ways you can customize it. So fun! what?! These are so cute! I am definitely going to have to save this idea for when my baby is older. So many good things on the blogs lately that I hope not to forget! This is amazing!!!!!!!!!!!!!!!! I must make! Thank you! Mr. G loves magnets and they're nice and big too! This is so wonderful! My little is only 14 months old and even though he can't "tell" me the stories, I will be making these anyways and telling him the stories! What a fun way to switch it up from books (even though we love our books, too). I am a HUGE DIY supporter so this is fantastic, thank you for sharing! I can't wait to get started, Hobby Lobby here I come! This is SUCH a great idea. I can promise you I will be trying it out! Thank you so much for sharing!!! WOW! This is amazing! Sometimes I really don't like the obnoxious plastic magnets & these are perfect & very minimal! Thank you for sharing this cute idea! Thanks !! 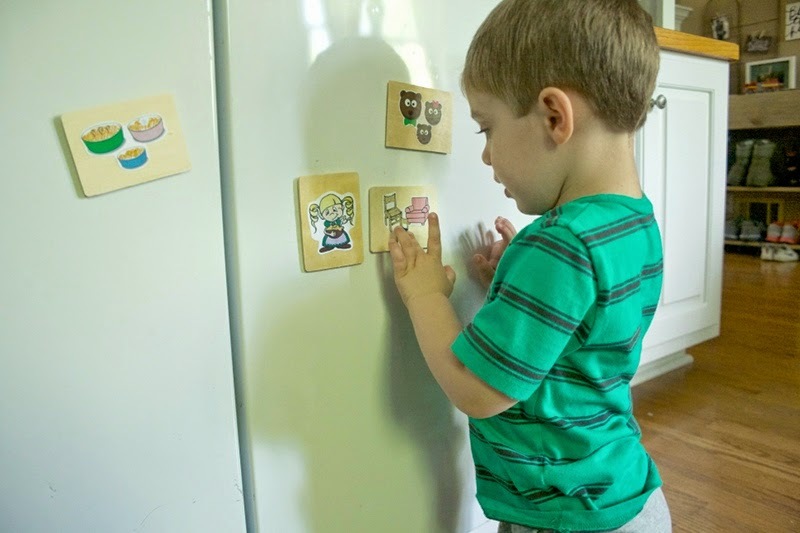 Amen about the little magnets…My son also has some that have really weak magnets and I feel like they're always on the floor rather than the fridge! Thanks for stopping by! THIS is adorable, you are the cutest. 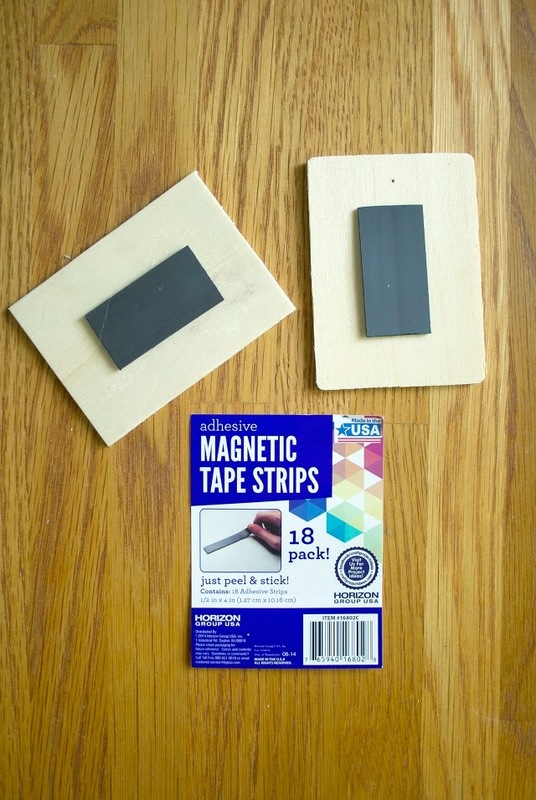 You could really make a magnet out of anything!! Even their own drawings. Thanks! And that's a great idea! !